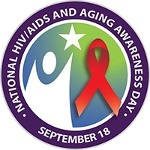 National HIV/AIDS and Aging Awareness Day is a U.S. awareness day observed on September 18 every year. Like most HIV/AIDS-related awareness days, it is supported by AIDS.gov, an internet portal for all federal domestic HIV and AIDS resources and information. According to the information provided by the Centers for Disease Control and Prevention (CDC), people aged 55 and older accounted for 26% of the 1.2 million people living with HIV (diagnosed or undiagnosed) in the U.S. in 2013. Older patients are often diagnosed late in the course of infection, which leads to shorter HIV-to-AIDS intervals. In 2014, about 40% of people aged 55 and older were diagnosed with AIDS at the time of HIV diagnosis. There are several reasons for late diagnosis of HIV/AIDS in older people. Medical institutions are less focused on testing older people, while people aged 55 and older think that they are not exposed to the risk of infections or confuse the early symptoms of HIV with the signs of aging. National HIV/AIDS and Aging Awareness Day was launched to raise public awareness of the challenges that older Americans diagnosed with HIV have to face, as well as of the importance of HIV prevention, testing, care, and treatment among people aged 55 and older.